When Myles Kirk, a senior at Custer High School, had to decide an area of focus for his senior project, he knew he wanted to help the ranchers who lost livestock during the October 2013 blizzard that left many thousands of head of cattle dead. Typically, senior projects can range from anything and everything – building something, hosting a fundraising relay, teaching younger students a skill, or volunteering in the community. "Our senior project class curriculum required us to have a project that benefited the community," Myles explained. "I wanted to go above and beyond just a normal senior project and chose to help the local ranching community. This storm hit a lot of people hard and every little bit counts. We always say that 'somebody' should do something about it, and I realized that I am somebody and can help out too." Myles lives on his family's ranch near Pringle, S.D., and although he didn't personally lose any cattle, he has many friends and neighbors who did. On April 12, the 18-year old hosted a steak feed to benefit the Rancher Relief Fund (RRF), which was established on Oct. 8, 2013, by the South Dakota Stockgrowers Association, South Dakota Cattlemen's Association and South Dakota Sheepgrowers Association along with the Black Hills Area Community Foundation to provide support and relief assistance to those in the agriculture industry impacted by the blizzard. RRF has distributed more than $775,000 to impacted livestock producers in the months following the blizzard, with an additional $3.3 million still to be disbursed. At first, Myles was worried not many people would show up. His goal was to raise $2,000. By the time the steak feed rolled around, the bigger concern became whether or not there would be enough food to feed the large crowd. 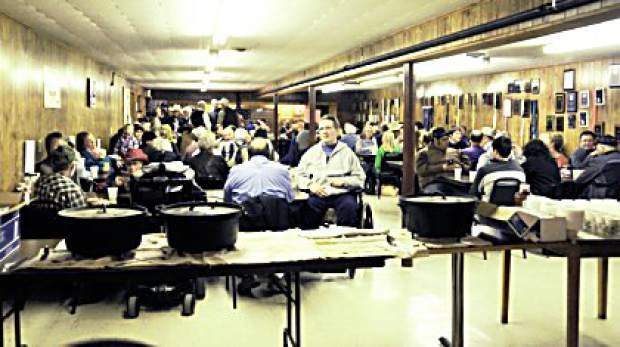 Myles hosted his steak feed fundraiser at the Custer VFW Post 3442. The event raised $3,658.58 for RRF. He purchased beef and all of the fixings from local grocery store, Lynn's Dakotamart. Ranchers Clayton and Rhonda Sander, well-known for their chuck wagon cowboy-style cooking expertise, cooked up the meal in Dutch ovens over an open fire for the 186 people who showed up to support the cause. The meal included beef filets, sirloin steaks, baked beans, scalloped potatoes, peach cobbler, iced tea, lemonade and cowboy coffee. Tickets were sold at the door for $15/person to raise money for RRF. "Mealtime on the ranch is a sacred time and I wanted to bring that into play during my project," Myles said. "For Myles to say that mealtime is sacred means a lot to me, since it's been very important to me that our family all sits down together at the table for supper, no matter how tough it can be sometimes," said Amy Kirk, Myles' mother, columnist and author of "A Ranchwife's Slant, Cowboys, Kids, and Ranch Life." 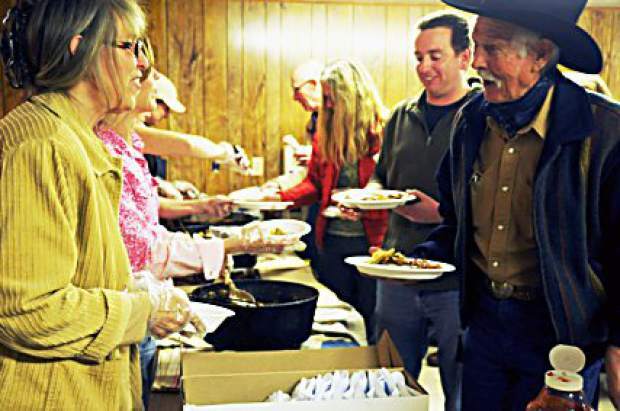 "When our son Myles said he was thinking about putting on a steak feed to benefit the Rancher Relief Fund for his senior project, I was very proud that he came up with that particular idea all on his own," added Amy. "There was a part of me that considered suggesting a less labor-intensive project, knowing that he had no idea what would be involved in order to do something like this, but instead I kept my mouth shut and decided I would support him any way I could. At Custer High School, senior projects have to be community service related. For Myles to come up with a project that would benefit the community and agriculture was something I was even more proud of." Knowing that establishing a ranching operation takes generations of hard work, Myles said he sympathized with those who lost it all because of one freak storm. "The biggest reason I chose Rancher Relief Fund is because I know it's a good cause," he said. "Every cent we put in there helps the ranchers who lost many years of back-breaking work that was all swept away in the blink of an eye because of this storm." "Our cattle herd was not affected by the notorious October snowstorm, Atlas, but we knew of others that had been hit by the devastation and I liked the idea of being able to assist our son in raising the bar a notch to help those who took a hit from Atlas," said Amy. "Our whole family, plus relatives and family friends, volunteered in bringing a community of people together for fellowship, conversation, and an outstanding Dutch oven and open fire steak dinner as a fundraiser for the relief fund. I would call the event a success." Myles's hard work and generosity didn't go unnoticed. An Associated Press release about his efforts spread across the nation, with reports of his fundraiser hitting newsstands in publications such as USA Today and the Washington Post, among many others. His fifteen minutes of fame weren't a big deal to the teenager, but helping the ranchers was certainly worthwhile for his senior project. The South Dakota Beef Industry Council provided support for the event, giving Myles nutritional brochures and reading material to pass out during the event. In addition to ticket sales, money was also raised through donations offered and a raffle for a hand-carved walking stick.